Posted on Wed 28 Sep 2011 at 4:54 PM PST. Filed under General. When I was on a very-low-calorie diet in 2006 (which cost me half my hair), I had constant cravings. I wanted chocolate, cakes, and white rice. I was never big on pasta, pizza or bread, but I loved my donuts, milk chocolate and Indian fragrance rice. So when on a diet, I’d go with artificial sugars or small quantities of high-caloric foods. But this was never satisfying. I managed to stay on this diet for 3 months, cheating every few days. Now that I’m on the Paleo diet, things are different. Since Paleo brought back my health, I haven’t looked back. I do not crave donuts, chocolates, or rice anymore. I don’t give a damn anymore about grains and high amounts of sugar. I educated myself of their bad health effects and addictiveness, and so I now see them as the enemy. Honestly, I don’t know why I don’t crave them though. I should be, but I don’t. I think that this is a case of mind power over body. I was willing to do anything to get my health back, so when I finally managed to figure it all out and subsequently become symptom-free, not eating certain foods for the rest of my life was a non-issue anymore. I haven’t cheated at all so far, neither I expect me to. If anything, I feel full most of the time just by eating enough. And I’ve lost 7 lbs so far. Of course, there were times that my body was asking for some sugar (I was trying to deprive it from sugar on purpose, since I suffer from SIBO-style IBS), so these were the times that I’d simply eat a fruit. It worked every time. If instead I’d eat a teaspoon of honey, I’d feel guilty afterwards (even if the diet allows honey in moderation). I don’t know if I’m the oddball here (or if I have a hypothyroid condition I don’t know about that makes me lose my appetite), but I’m not craving for any food anymore, except some fruit. So it made me MAD when I read two cases recently about two different women (one with diabetes and another one with IBS) who they gave up on their gluten-free diet because it was “too hard”, EVEN if they became asymptomatic with that diet. Here they have an easy, cheap, and healthy way to get out of a bad illness’ effects, and instead they go belly up selling their soul to the pasta devil. As my husband very well noted the other day: “they’re just not desperate-enough“. I was. And it paid off. 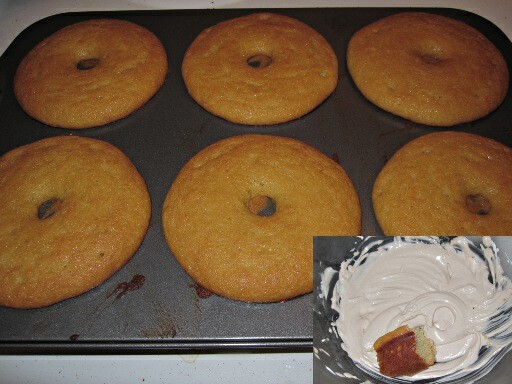 Update, Sept 30 2011: I made some Paleo donuts today. Honestly, they taste more like cake than donuts, but they were actually very good. I had one and I couldn’t eat another. Too filling. In the past, I could have eaten 2 of them in one sitting. I had it with some whipped lactose-free sour cream (with added honey).